Dreyfus Field opened to the public in 1927 giving the Columbia Comers their first real ballpark. 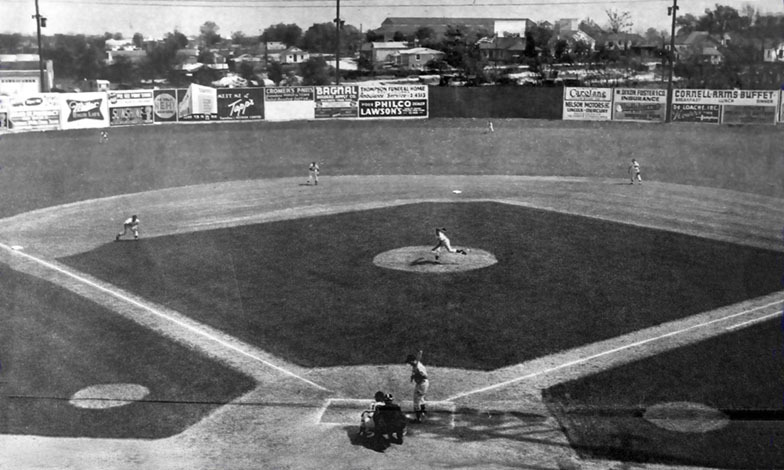 Previous to moving here, the Southern League's Comers had been going back and forth between playing at the local University's Davis Field and at the Fairgrounds. The Comers had dubbed the Fairgrounds, "Comer Park" in 1926 to try and make it feel more like home and less temporary, but the grandstands burned down mid-season, leaving the team homeless again. Needless to say when this stunning new wooden ballpark opened in 1927... it was a homecoming long overdue, for a team that had more than proven its worth. During this period of time, the Southern League was named the "South Atlantic League" but is not related in any way to the Single-A "SALLY League" you know today. This South Atlantic League would be renamed and become the Double-A Southern League that we all today, as home to many affiliated AA franchises. Because of this, we will refer to this league in its future moniker... the Southern League throughout this gallery/history so as to take away any confusion. The Comers' biggest slugger during this period was Mack Hillis who's 31 2B, 12 3B, 10 HR and .348 batting average led him to be called up to the Pirates at the end of the 1928 season. The Comers would produce quite a few future Major Leaguers in fact, though none would go on to become future All-Stars. The Comers would play their final season in 1930 when this future Southern League ran into money issues and cut their losses. The folding of the league... though temporary, couldn't have come at a better time for Columbia who had suddenly fallen into a horrible slump. Paul Coltrane had put up a 6-22 record. John Stoneham's 19 2B, 21 3B, 9 HR, .327 Avg, offensive display couldn't keep the Comers from finishing off with a miserable 39-101 loss record.